You may notice that these two graphs look pretty different. 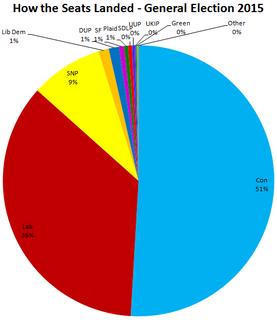 The Conservative Party won a majority of the seats with only 37% of the vote. The Scottish National Party, due to its geographic concentration in Scotland, got a share of the seats in Parliament nearly double its share of the popular vote. 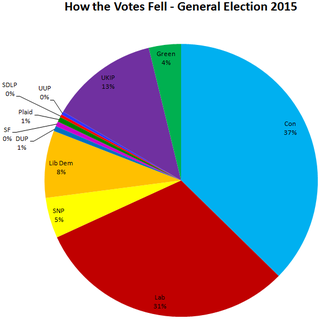 In contrast, the Liberal Democratic Party got only 8 out of the 650 seats despite winning 8% of the popular vote, the Green Party got only 1 seat with 4% of the vote, and, most egregiously, the UK Independence Party got only 1 seat with 12% of the vote. While I have no objections to UKIP getting cheated out of political power, this does not seem like a fair and democratic outcome, and yet this sort of thing is an inevitable consequence of first-past-the-post elections for single-member legislative districts. This sort of thing happens even with two party systems like in the US, where not only do third parties get completely shut out, the balance of power between the two major parties is also skewed: in 2012, the Republicans won a majority of seats in the House of Representatives, despite the Democrats winning more total votes. This has been widely attributed to Gerrymandering, but the fact that Democratic votes are more geographically concentrated than Republican votes contributes even more. Proportional representation is an easy solution to this problem. One of the criticisms of proportional representation is that having representatives associated with a district ties them closer to the voters. There are variants of proportional representation that address this, but here I want to propose another one. But first, let's talk about random sampling. If instead of counting every vote in an election, we randomly sampled some small fraction of the ballots and counted those, we would get the same result almost every time, with discrepancies being statistically possible only when the vote is very close (which seems fine to me; getting 50.1% of the vote does not seem to me to confer much more legitimacy than getting 49.9% of the vote does). While this might make elections slightly cheaper to administer, it would be a massive under-use of the power of randomization. In California (and also, I am under the impression, in most other U.S. states, and many other countries), elections tend to include a massive profusion of state and local officials and ballot measures. Each of these individually requires a significant amount of research, so it is prohibitively time-consuming to adequately research every ballot question. When I vote, I usually feel like I did not have time to research most of the ballot questions enough to make an informed vote, and yet I suspect I still spend more time researching them than average. My proposed solution to this is for each voter to be randomly assigned one ballot question that they get to vote on. When you only have one issue you can vote on, it is much easier to thoroughly research it. Thus this system should result in more informed voters. People would likely object that this system is undemocratic, since not everyone gets to vote on each ballot question. But in fact, this system would probably end up being more democratic than the current one, since it would make voting easier and thus probably increase turnout, making the sample of people voting on each issue more representative of the electorate as a whole, even while comprising a smaller fraction of it. Some people might not vote because of being assigned to an issue that they are not interested in, but most such people probably wouldn't have voted on that issue anyway; I'd bet there would be significantly more people who would vote on an issue if it was the only one they could vote on, but wouldn't vote on it if they could vote on all of them. Furthermore, since people would have more time to research their ballot question, they would be less reliant on information shoved in their faces in the form of advertising, so this would decrease the influence of special interest groups in politics, arguably also making the system more democratic. So far I've been suggesting that enough votes should be sampled that the outcome of each election is virtually guaranteed to be the same as it would be if all the votes were counted, with all the exceptions being when the vote is very close. But what happens when we don't sample enough votes for that? What if we take it all the way to the extreme and only sample one vote? This would not be appropriate for ballot measures or executive officials, but for electing the members of a legislature with a large number of single-member districts, this actually has some pretty nice properties. Since each ballot is equally likely to be the one that gets counted, the probability of each candidate getting elected is proportional to the number of votes they get. Averaged over a large number of districts, this means that the number of legislators elected from each political party will be approximately proportional to the popular support for that party. Thus, this simulates proportional representation with single-member electoral districts. This is very similar to a sortition, in which legislatures are a random sample of the population. The primary difference is that in a sortition, many of the people randomly selected to be legislators may have little interest in or ability for the job. However, in this system, someone would still have to demonstrate interest by running for election in order to be selected. To further discourage frivolous campaigns, costs could be imposed on the candidates, for instance by requiring them to gather signatures to qualify for the ballot, to ensure that no one gets elected who isn't serious about their intent to serve in the legislature. A small further advantage of this system over a sortition is that it ensures that the legislators are evenly distributed geographically, so the variance of the number of seats won by each political coalition would be slightly smaller than it would be under completely random sampling. Another advantage of my randomized system over first-past-the-post and proportional representation is that it avoids electoral paradoxes that plague deterministic systems. It avoids the Alabama and population paradoxes, which proportional representation is vulnerable to. There is also no incentive for tactical voting, since if your vote gets selected, the others do not constrain which candidates you can get elected. And there is no incentive for Gerrymandering, since the expected number of seats won by a party will be proportional to its vote count no matter how the districts are drawn, provided they all have equal numbers of voters. A possible objection to this system is that candidates can get elected with support from only a small fraction of their constituents. But this does not seem that bad to me. Even under first-past-the-post, it is the norm for a large fraction of the constituents to vote against the winning candidate. Even in safe seats, the fraction of voters who vote against the winner is typically fairly significant (e.g., a third), and these voters never get the chance to be represented by their preferred candidate. Under the randomized system, any significant local coalition would get a chance of representation sometimes, and dominant coalitions would be represented most of the time. And if a party is dominant in a district, then even if the representative for that district ends up not being aligned with that party, there will likely be nearby districts that are represented by that party. For example, the San Francisco Bay Area is so dominated by Democrats that all of its members of the House of Representatives and the state legislature are Democrats, leaving the Bay Area Republicans unrepresented. Using the randomized system, a few Republicans would get elected in the Bay Area, so the constituency of Bay Area Republicans get their representation, and the Democrats in the districts that end up getting represented by Republicans would still have plenty of Democratic legislators in neighboring districts to represent their interests. One significant disadvantage is that it would be difficult for legislators to accumulate much experience in the legislature, since they would have a significant chance of losing each re-election even if they have broad support in their district. Primarily for this reason, I think this randomized system is inferior to single transferable vote and party list proportional representation. But despite this, I still think it is not too terrible, and would be a significant improvement over the current system. Sometimes you can make the system more democratic by counting fewer votes.